This coin commemorates the 70th anniversary of the landing of the allied forces on the beaches of Normandy on 6th June 1944. (D-DAY). The coin is divided into two sections by a horizontal stripe running from nine o’clock to three o’clock. The inscription in the stripe reads “70e ANNIVERSAIRE DU DÉBARQUMENT” (70th anniversary of the landing). Above this stripe is a very bold inscription “DDAY”. Immediately above are the dates 1944-2014. Just under DDAY is the country designation – RF. Under the stripe there are images of boot imprints – these symbolizing the soldiers going across the beach. A wave is shown that comes and effaces the impressions left by the boots. In the wave are the words of a French poem – “Les sanglots longs de violons de l’automme/Blessent moncoeur d’une lasngueur monotone” ( The long sobs of the violins of autumn / Injury my heart with a monotonous tiredness). This was broadcast over the radio from London and was the signal for the French resistance to begin a disruptive campaign behind the German lines. On the edge of the inner circle, between five and six o’clock is the mint mark and between five and four o’clock is the mark of the mint master. 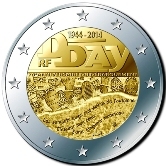 Return from French Commemorative 2014 to euro coin collector.